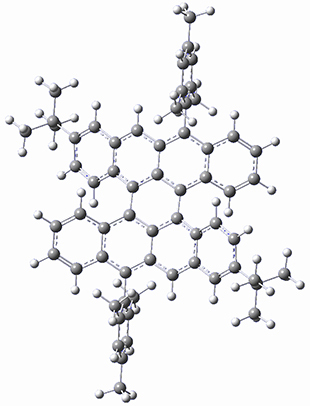 Feng, Müller and co-workers have prepared a bistetracene analogue 1.1 This molecule displays some interesting features. While a closed shell Kekule structure can be written, a biradical structure results in more closed Clar rings, suggesting that perhaps the molecule is a ground state singlet biradical. The loss of NMR signals with increasing temperature along with an EPR signal that increases with temperature both support the notion of a ground state singlet biradical with a triplet excited state. The EPR measurement suggest as singlet-triplet gap of 3.4 kcal mol-1. The optimized B3LYP/6-31G(d,p) geometries of the biradical singlet and triplet states are shown in Figure 1. The singlet is lower in energy by 6.7 kcal mol-1. The largest spin densities are on the carbons that carry the lone electron within the diradical-type Kekule structures. Figure 1. 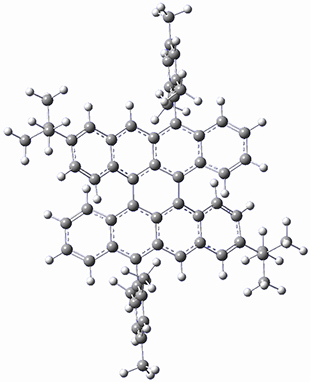 B3LYP/6-31G(d,p) optimized geometries of the biradical singlet and triplet states of 1. 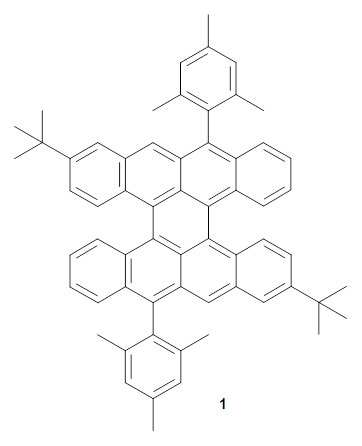 (1) Liu, J.; Ravat, P.; Wagner, M.; Baumgarten, M.; Feng, X.; Müllen, K. "Tetrabenzo[a,f,j,o]perylene: A Polycyclic Aromatic Hydrocarbon With An Open-Shell Singlet Biradical Ground State," Angew. Chem. Int. Ed. 2015, 54, 12442-12446, DOI: 10.1002/anie.201502657.